One of the most common liver diseases is steatosis, or better known as fatty liver. Increased amount of fat deposits may cause some big complications, as well as liver’s failure. The liver is one of the most important organs in our body. It has a role to breakdown fat, maintain the level of sugar in the blood, produce enzymes and keep vitamins, minerals, and glycogen. No other vital organ in our body can replace the liver. Increased blood pressure, bloating, fatigue or high cholesterol levels are some indicators which tells us two things: liver’s overload and fats’ disturbed metabolism. Minimum amount of fat will not cause any complications. On the other hand, if there are 5-10% fats by weight of your liver, it means that we are dealing with steatosis (fatty liver). This condition can occur as a result of alcoholism. This disease is called a “silent disease”. Its symptoms are hardly noticeable. In some cases, it takes a few years to enable people to notice that the disease develops in their body. If it evolves, you might feel untypical signs such as nausea, weakness, appetite loss, confusion or concentration problems. Also, you may feel pain in the central or upper abdomen area; appear dark spots on the skin or lower arms and enlargement of the liver. In alcoholics, these symptoms are exacerbated by continuous alcohol consumption. 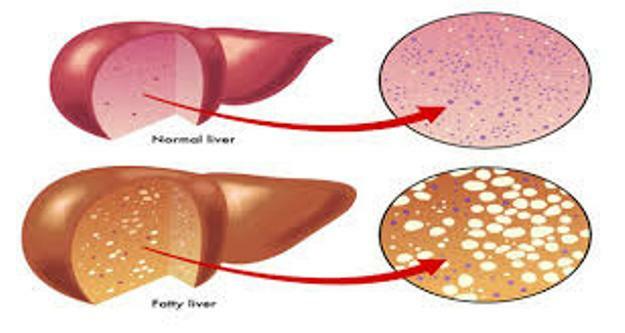 Fatty liver can be detected, or prevented in people who do not consume alcohol. How to treat this health condition? There is no remedy for oily liver. There is only a treatment for preventing or reducing and controlling the disease. The person who discovered the disease should immediately stop consuming alcohol. There is a special diet and nutrition. Overweight people must immediately reduce weight because of their health. Regular exercise, proper diet and physical activity can also help you to improve this health state you are in. What kind of diet you should practice? Besides decreasing the calorie intake, you should also decrease intake of any kind of processed foods which contain carbohydrates such as white bread, potato, pasta, concentrated sugar, corn and trans fats. What does oily liver proper diet mean? Margarine, butter, cream and dishes prepared on steam, baked or boiled in water with a small amount of olive oil, are food that you must immediately leave. Also very effective measure for withdrawal or slowing the disease is to avoid unnecessary pills. Stick yourself to natural ingredient because even the ordinary minerals and vitamins can cause health problems. In addition we will present to you teas which are great for liver treatment. Pour water over chopped dandelion root, cover with a lid and let it stand for 20 minutes. After that, try and drink. Drink this tea in the morning and in the evening. Make a mixture with all of the above ingredients. Take a spoonful of the mixture and pour water on the mixture. Leave the mixture for a few minutes. Drink the tea without sweetener.